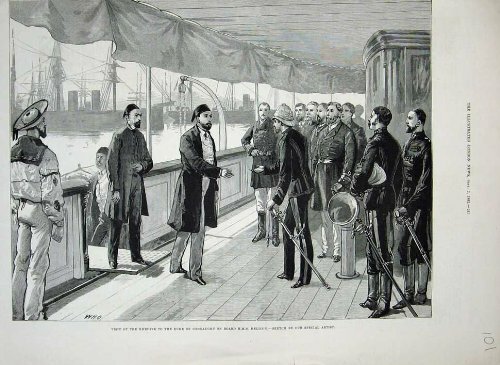 Old Original Antique Victorian Print 1882 khedive duke connaught h.M.S helicon ship war army . Old antique historical victorian prints maps and historic fine art---------- full page from the illustrated london news, an illustrated weekly newspaper weeks date as shown on top of page, the size of each page is approx ( injcluding margins as shown )imately 15.5 x 11 inches (395x280). All are genuine antique prints and not modern copies, the illustrated london news is an illustrated magazine which was first printed in 1842 and is the finest pictorial example of a historic social record of british and world events up to the present day. The iln is known for its coverage of the following subjects the wars, ships, boats, guns, sailing, portraits, fine art, old and antique prints, wood cut, wood engravings, early photographs, victorian life, victorian culture, kings, queens, royalty, travels, adventures, natural history, birds, fish, mammals, fishing, hunting, shooting, fox hunting, sports including tennis, cricket, football, horse racing, politics and many more items of interest founded by herbert ingram may 14th 1842.